ECO Blend products are as strong as products made with prime material and, in some cases, ECO Blend products could be stronger. ECO Blend also provides durability which means you can be confident the products will perform as expected. 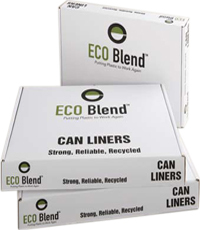 ECO Blend products are “putting plastic back to work again” by using recycled bags and film. All too often plastic is disposed of in landfills, or worse, is left to litter the land. We are committed to protecting the environment by recycling plastic and putting it back into quality products.